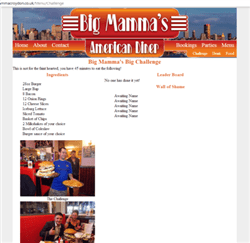 Big Mamma's American Diner was a Croydon based bar and restaurant, offering a wide selection of drinks, meals, milkshakes and deserts. Their website was built in Ousia CMS version 2, the website could be updated by the owner, saving them time and money. We had also provided hosting for them. Unfortunately the company suffered a fire and decided to close. They had already commissioned their logo, so it gave us something to play with. A New York skyline was been added to the background to enforce the American Feel and there were 3 absolute placed menus all with individual settings, and used our content management system.